I can't resist passing on a few selected clips from Anthony Lane's review of the new Pixar Movie, "Inside Out." Pixar writer and director Pete Docter, in describing the actor's inside a child's head, has produced an an engaging depiction of of many of the ideas I try to get across (much more obtusely and ponderously) in my MindStuff: Guide for the curious user written ten years ago. The new Pixar film, “Inside Out,” is about the life of Riley. She is an only child...who, aged eleven, moves with her parents ... from Minnesota to San Francisco. Not much happens...The bulk of the movie takes place out of sight, within the confines of Riley’s mind, where primary feelings affect her every move. There are five in all: Joy (Amy Poehler), who is butter-yellow and fuzzy at the edges; Anger (Lewis Black), who looks like SpongeBob soaked in blood; Fear (Bill Hader), a writhing dweeb with a bow tie; Disgust (Mindy Kaling), who has frosted green hair and lashes; and Sadness (Phyllis Smith), a bespectacled blob of blue. Now and then, they contend for supremacy, but mostly they join forces and react to the world beyond. They behold it through Riley’s eyes, from a spiffy control center, like Kirk, Spock, and the gang on the bridge of the Enterprise...Dreams are produced in—where else?—a dream factory, with soundstages and camera crews. It closes down when she wakes. Experiences are delivered to the control room as if they were bowling balls, colored according to their mood; some are stored away, others dropped into a pit of forgetfulness, where they darken and crumble like spent coals, and a few are enthroned as core memories. And that, we are told, is how a personality is made. So brisk is the defining of all this...that we barely pause to consider the assumptions behind it. Pixar...has no time for old-school habits, like lodging the emotions in the heart...They are located squarely in the brain, presumably displacing Reason, whom we never meet, but whom I picture as French, bald, and wearing an English suit. ... Neurologists and therapists will examine the movie and pronounce themselves largely satisfied. ... I sensed..., that I was following the transcription, by very clever adults, of their own theorizing—literate, frantic, and endlessly chewed over—on the subject of human development, rather than the story of a growing girl. ...the biggest laughs, without exception, come when we exit Riley’s head and take a quick vacation to the crania—and the mania—of others. During an argument at dinner, for instance, her father’s emotions are miles away; all of them are watching a hockey game. And, as the closing credits approach, Docter, realizing that he has a pack of wild gags that have been kept leashed for too long, releases the lot in a flurry. We peek inside the mind of a dog, a cat, a prepubescent boy (“Girl! Girl!” the alarms sing out), and, best of all, the cool chick with eyeshadow at Riley’s school, voiced by Rashida Jones. ...You start to wonder what a grownup sequel to “Inside Out” would look like, with a host of new feelings barging into central command and wrenching the controls away from Joy. Would Lust be spoken by Rupert Everett, or would it sound more like Chico Marx, working his way through a chorus line? How about Love of Money, or black-browed Mortal Terror? There are places, I guess, where even Pixar cannot go. Neuroanatomical correlates of the income-achievement gap. The difference in academic achievement between students from higher- and lower-income backgrounds is substantial and growing. A group of collaborators from M.I.T., Harvard, and Columbia has examined the neuroanatomical correlates of the income-achievement gap by comparing the structure of the cerebral cortex (which supports perception, language, and thought) in public-school students who do (lower income) and do not (higher income) receive free or reduced-price lunch, and by relating this neuroanatomy to performance on standardized tests of academic skills. For further discussion of effects of poverty on young brains see the article by Ostrander in The New Yorker. In the United States, the difference in academic achievement between higher- and lower-income students (i.e., the income-achievement gap) is substantial and growing. In the research reported here, we investigated neuroanatomical correlates of this gap in adolescents (N = 58) in whom academic achievement was measured by statewide standardized testing. Cortical gray-matter volume was significantly greater in students from higher-income backgrounds (n = 35) than in students from lower-income backgrounds (n = 23), but cortical white-matter volume and total cortical surface area did not differ significantly between groups. Cortical thickness in all lobes of the brain was greater in students from higher-income than lower-income backgrounds. Greater cortical thickness, particularly in temporal and occipital lobes, was associated with better test performance. These results represent the first evidence that cortical thickness in higher- and lower-income students differs across broad swaths of the brain and that cortical thickness is related to scores on academic-achievement tests. 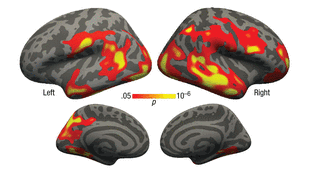 Cortical-thickness differences between income groups. The brain images in (a) show regions where cortical thickness was significantly greater in the higher-income (HI) group than in the lower-income (LI) group. Facebook internal research shows its algorithms enhance political polarization. Bakshy et al. examine... whether Facebook's curation of news feeds prevents the intersection of conflicting points of view. That is, does a “filter bubble” emerge from this algorithmic curation process, so that individuals only see posts that they agree with? Such an algorithmic sorting has the potential to be unhealthy for our democracy, fostering polarization and undermining the construction of a vision of the common good...Their answer, after parsing the Facebook pages of ∼10 million U.S. individuals with self-declared ideologies, is that the curation does ideologically filter what we see. It is laudable that Facebook supported this research and has invested in the public good of general scientific knowledge. Indeed, the information age hegemons should proactively support research on the ethical implications of the systems that they build. Facebook deserves great credit for building a talented research group and for conducting this research in a public way. I've sometimes wondered why I feel a bit flat (anhedonic) after taking acetaminophen (Tylenol). Durso et al. show that it blunts sensitivity to both negative and positive stimuli. Acetaminophen, an effective and popular over-the-counter pain reliever (e.g., the active ingredient in Tylenol), has recently been shown to blunt individuals’ reactivity to a range of negative stimuli in addition to physical pain. Because accumulating research has shown that individuals’ reactivity to both negative and positive stimuli can be influenced by a single factor (an idea known as differential susceptibility), we conducted two experiments testing whether acetaminophen blunted individuals’ evaluations of and emotional reactions to both negative and positive images from the International Affective Picture System. Participants who took acetaminophen evaluated unpleasant stimuli less negatively and pleasant stimuli less positively, compared with participants who took a placebo. Participants in the acetaminophen condition also rated both negative and positive stimuli as less emotionally arousing than did participants in the placebo condition (Studies 1 and 2), whereas nonevaluative ratings (extent of color saturation in each image; Study 2) were not affected by drug condition. These findings suggest that acetaminophen has a general blunting effect on individuals’ evaluative and emotional processing, irrespective of negative or positive valence. How is creativity helped by being just a little bit crazy? Park et al. examine individuals with schizotypal personality disorder, which is characterized by need for social isolation, anxiety in social situations, odd behavior and thinking, and often unconventional beliefs, but does not engage the false beliefs, unclear or confused thinking, and auditory hallucinations characteristic of schizophrenia. They suggest that the greater levels of creative behavior found in such individuals correlates with deactivation of specific cortical areas, in agreement with 'less is more' models for creativity. Empirical studies indicate a link between creativity and schizotypal personality traits, where individuals who score highly on schizotypy measures also display greater levels of creative behaviour. However, the exact nature of this relationship is not yet clear, with only a few studies examining this association using neuroimaging methods. In the present study, the neural substrates of creative thinking were assessed with a drawing task paradigm in healthy individuals using fMRI. These regions were then statistically correlated with the participants’ level of schizotypy as measured by the Oxford–Liverpool Inventory of Feelings and Experiences (O-LIFE), which is a questionnaire consisting of four dimensions. Neural activations associated with the creativity task were observed in bilateral inferior temporal gyri, left insula, left parietal lobule, right angular gyrus, as well as regions in the prefrontal cortex. This widespread pattern of activation suggests that creative thinking utilises multiple neurocognitive networks, with creative production being the result of collaboration between these regions. Furthermore, the correlational analyses found the Unusual Experiences factor of the O-LIFE to be the most common dimension associated with these areas, followed by the Impulsive Nonconformity dimension. These correlations were negative, indicating that individuals who scored the highest in these factors displayed the least amount of activation when performing the creative task. This is in line with the idea that ‘less is more’ for creativity, where the deactivation of specific cortical areas may facilitate creativity. Thus, these findings contribute to the evidence of a common neural basis between creativity and schizotypy. A new class of anti-aging drugs that selectively kill senescent cells. As organisms age, they accumulate cells that can no longer proliferate. Such cells— termed “senescent”—persist and appear to promote aging by producing and secreting a variety of proteins. Zhu et al. tested whether drugs that inhibit cellular signaling pathways that make senescent cells resistant to stress and cell death could deplete senescent cells in mice. A combination of two drugs that inhibit such pathways selectively killed senescent cells in vitro, improved heart and vascular function in aging mice, and improved symptoms in a mouse model of accelerated aging. Although pinpointing the relevant targets of these drugs is difficult, the studies indicate that selectively targeting senescent cells with small molecules may be feasible. The healthspan of mice is enhanced by killing senescent cells using a transgenic suicide gene. Achieving the same using small molecules would have a tremendous impact on quality of life and the burden of age-related chronic diseases. Here, we describe the rationale for identification and validation of a new class of drugs termed senolytics, which selectively kill senescent cells. By transcript analysis, we discovered increased expression of pro-survival networks in senescent cells, consistent with their established resistance to apoptosis. Using siRNA to silence expression of key nodes of this network, including ephrins (EFNB1 or 3), PI3Kδ, p21, BCL-xL, or plasminogen-activated inhibitor-2, killed senescent cells, but not proliferating or quiescent, differentiated cells. Drugs targeting these same factors selectively killed senescent cells. Dasatinib eliminated senescent human fat cell progenitors, while quercetin was more effective against senescent human endothelial cells and mouse BM-MSCs. The combination of dasatinib and quercetin was effective in eliminating senescent MEFs. In vivo, this combination reduced senescent cell burden in chronologically aged, radiation-exposed, and progeroid Ercc1−/Δ mice. In old mice, cardiac function and carotid vascular reactivity were improved 5 days after a single dose. Following irradiation of one limb in mice, a single dose led to improved exercise capacity for at least 7 months following drug treatment. Periodic drug administration extended healthspan in Ercc1−/Δ mice, delaying age-related symptoms and pathology, osteoporosis, and loss of intervertebral disk proteoglycans. These results demonstrate the feasibility of selectively ablating senescent cells and the efficacy of senolytics for alleviating symptoms of frailty and extending healthspan. Ocytocin reverses amphetamine-induced deficits in social bonding. 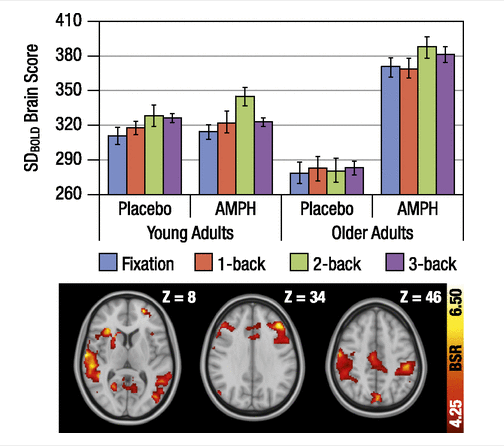 As a followup to yesterday's post on a positive effects of amphetamine on the cognition of aging adults, I thought it would be interesting to point out a dark side of amphetamine by noting the paper by Young et al. showing reversal of amphetamine-induced social impairments by oxytocin treatment. (In addicts who fail to develop or maintain intimate relationships amphetamine appears to hijack the brain's social reward circuitry. Clinical trials in humans are indicating a clear potential for oxytocin as a treatment for addiction.) They use the prairie vole male pair bonding model. Drug addiction has devastating consequences on social behaviors and can lead to the impairment of social bonding. Accumulating evidence indicates that alterations in oxytocin (OT) and dopamine (DA) neurotransmission within brain reward circuitry may be involved. We investigated this possibility, as well as the therapeutic potential of OT for drug-induced social deficits, using the prairie vole (Microtus ochrogaster)—a socially monogamous rodent that forms enduring pair bonds between adult mates. We demonstrate that repeated exposure to the commonly abused psychostimulant amphetamine (AMPH) inhibits the formation of partner preferences (an index of pair bonding) in female prairie voles. AMPH exposure also altered OT and DA neurotransmission in regions that mediate partner preference formation: it decreased OT and DA D2 receptor immunoreactivity in the medial prefrontal cortex (mPFC) and nucleus accumbens (NAcc), respectively, and increased NAcc DA levels. Administration of OT directly into the mPFC of AMPH-exposed voles restored partner preferences, and altered NAcc DA levels, and this effect was dependent on OT receptor activation. Together, these data suggest that repeated AMPH exposure impairs pair bonding through an OT-mediated mechanism, and that OT and DA systems within brain reward circuitry may interact to mediate the complex relationship between drug abuse and social bonding. Further, these results provide empirical support for the idea that the central OT system may represent an important target for the treatment of social deficits in addiction. A bit of amphetamine turns older brains into younger brains. Fascinating. Garrett et al. show that raising dopamine levels with amphetamine (sold as the prescription drug Adderall, for ADHD), increases the brain wave variability that enhances working memory, so that seniors perform as well as younger people on the n-back working memory test. (Common prescription doses of 5-30 mg act as a cognitive enhancer. Higher doses can be aphrodisiac, euphoriant, addictive, and have many bad side effects.) I pass on both their statement of significance and abstract. Also, a figure that tempts me to try to get an adderall prescription and do a self experiment. Younger, better performing adults typically show greater brain signal variability than older, poorer performers, but the mechanisms underlying this observation remain elusive. We attempt to restore deficient functional-MRI–based blood oxygen level-dependent (BOLD) signal variability (SDBOLD) levels in older adults by boosting dopamine via d-amphetamine (AMPH). Notably, older adults met or exceeded young adult SDBOLD levels under AMPH. AMPH-driven changes in SDSDBOLD also predicted AMPH-driven changes in reaction time speed and variability on a working memory task, but depended greatly on age and drug administration order. These findings (i) suggest that dopamine may account for adult age differences in brain signal variability and (ii) highlight the importance of considering practice effects and state dependencies when evaluating the neurochemical basis of age- and cognition-related brain dynamics. Better-performing younger adults typically express greater brain signal variability relative to older, poorer performers. Mechanisms for age and performance-graded differences in brain dynamics have, however, not yet been uncovered. Given the age-related decline of the dopamine (DA) system in normal cognitive aging, DA neuromodulation is one plausible mechanism. Hence, agents that boost systemic DA [such as d-amphetamine (AMPH)] may help to restore deficient signal variability levels. Furthermore, despite the standard practice of counterbalancing drug session order (AMPH first vs. placebo first), it remains understudied how AMPH may interact with practice effects, possibly influencing whether DA up-regulation is functional. We examined the effects of AMPH on functional-MRI–based blood oxygen level-dependent (BOLD) signal variability (SDBOLD) in younger and older adults during a working memory task (letter n-back). Older adults expressed lower brain signal variability at placebo, but met or exceeded young adult SDBOLD levels in the presence of AMPH. Drug session order greatly moderated change–change relations between AMPH-driven SDBOLD and reaction time means (RTmean) and SDs (RTSD). Older adults who received AMPH in the first session tended to improve in RTmean and RTSD when SDBOLD was boosted on AMPH, whereas younger and older adults who received AMPH in the second session showed either a performance improvement when SDBOLD decreased (for RTmean) or no effect at all (for RTSD). The present findings support the hypothesis that age differences in brain signal variability reflect aging-induced changes in dopaminergic neuromodulation. The observed interactions among AMPH, age, and session order highlight the state- and practice-dependent neurochemical basis of human brain dynamics. Figure. Increased BOLD variability and improved cognitive performance under AMPH. Multivariate partial least-squares model of relation between SDBOLD, Age Group, AMPH, and Task Condition. Higher brain scores reflect higher BOLD signal variability. Error bars represent bootstrapped 95% confidence intervals (1,000× with replacement). Brain images are plotted in neurological orientation (left is Left). AMPH, amphetamine; BSR, bootstrap ratio. Brain areas that place us in the past, present and future. Here is an interesting bit of work from Kurczek et al. showing that thinking about the past and future requires activation of the hippocampus in the medial temporal lobes,and referring oneself to that thinking requires medial prefrontal cortex. •We examined the role of the MTL and mPFC in self-projection and self-referential processing. •MTL patients were impaired in self-projection but not self-referential processing. •mPFC patients were impaired in self-referential processing but not self-projection. •MTL and mPFC make differential contributions to the neural network supporting self-projection and self-referential processing. Converging evidence points to a neural network that supports a range of abilities including remembering the past, thinking about the future, and introspecting about oneself and others. Neuroimaging studies find hippocampal activation during event construction tasks, and patients with hippocampal amnesia are impaired in their ability to (re)construct events of the past and the future. Neuroimaging studies of constructed experiences similarly implicate the medial prefrontal cortex (mPFC), but it remains unknown whether the mPFC is critical for such processes. The current study compares performance of five patients with bilateral mPFC damage, six patients with bilateral hippocampal damage, and demographically matched comparison participants on an event construction task. Participants were given a neutral cue word and asked to (re)construct events across four time conditions: real past, imagined past, imagined present, and future. These event narratives were analyzed for the number of internal and external details to quantify the extent of episodic (re)experiencing. Given the literature on the involvement of the mPFC in self-referential processing, we also analyzed the event narratives for self-references. The patients with mPFC damage did not differ from healthy comparison participants in their ability to construct highly detailed episodic events across time periods but displayed disruptions in their incorporation of the self. Patients with hippocampal damage showed the opposite pattern; they were impaired in their ability to construct highly detailed episodic events across time periods but not in their incorporation of the self. The results suggest differential contributions of hippocampus and medial prefrontal cortex to the distributed neural network for various forms of self-projection. Constructing rich false memories of committing crime. Yet another study, from Shaw and Porter, demonstrating how flawed our memory systems can be. This sort of experiment explains in part the continuing parade of individuals, imprisoned on the basis of false witness memories reported after suggestive interviews with zealous prosecutors, who are being released on the basis of evidence suppressed or ignored in their trial. Memory researchers long have speculated that certain tactics may lead people to recall crimes that never occurred, and thus could potentially lead to false confessions. This is the first study to provide evidence suggesting that full episodic false memories of committing crime can be generated in a controlled experimental setting. With suggestive memory-retrieval techniques, participants were induced to generate criminal and noncriminal emotional false memories, and we compared these false memories with true memories of emotional events. After three interviews, 70% of participants were classified as having false memories of committing a crime (theft, assault, or assault with a weapon) that led to police contact in early adolescence and volunteered a detailed false account. These reported false memories of crime were similar to false memories of noncriminal events and to true memory accounts, having the same kinds of complex descriptive and multisensory components. It appears that in the context of a highly suggestive interview, people can quite readily generate rich false memories of committing crime. Sign language as a window on universals in linguistic representation of events. According to a theoretical tradition dating back to Aristotle, verbs can be classified into two broad categories. Telic verbs (e.g., “decide,” “sell,” “die”) encode a logical endpoint, whereas atelic verbs (e.g., “think,” “negotiate,” “run”) do not, and the denoted event could therefore logically continue indefinitely. Here we show that sign languages encode telicity in a seemingly universal way and moreover that even nonsigners lacking any prior experience with sign language understand these encodings. In experiments 1–5, nonsigning English speakers accurately distinguished between telic (e.g., “decide”) and atelic (e.g., “think”) signs from (the historically unrelated) Italian Sign Language, Sign Language of the Netherlands, and Turkish Sign Language. These results were not due to participants' inferring that the sign merely imitated the action in question. In experiment 6, we used pseudosigns to show that the presence of a salient visual boundary at the end of a gesture was sufficient to elicit telic interpretations, whereas repeated movement without salient boundaries elicited atelic interpretations. Experiments 7–10 confirmed that these visual cues were used by all of the sign languages studied here. Together, these results suggest that signers and nonsigners share universally accessible notions of telicity as well as universally accessible “mapping biases” between telicity and visual form. Physical size and strength are associated with dominance and threat. The current study tested (i) whether men’s evaluations of male strangers would be negatively influenced by cues indicating physical formidability, and (ii) whether these evaluations would be influenced by oxytocin, a neuropeptide that mediates social behavior and reduces social anxiety. In a placebo-controlled double-blind design, we administered either oxytocin (24 I.U.) or placebo intranasally to 100 healthy males and assessed their responses to an image of either a physically formidable (strong) or physically non-formidable (weak) male peer. Whereas participants receiving placebo expressed dislike and avoidance of the strong male relative to the weak male, oxytocin selectively improved social evaluation of the strong male. These results provide first evidence that oxytocin regulates social evaluation of peers based on body features indicating strength and formidability. We discuss the possibility that oxytocin may promote the expansion of social networks by increasing openness toward potentially threatening individuals. Serotonin deficiency correlates with stress vulnerability. The biological factors that determine whether an individual develops mental illness, such as depression or posttraumatic stress disorder, or responds adequately to pharmacotherapy remain almost completely unknown. Using genetically modified mice, we demonstrate that low levels of brain serotonin lead to increased vulnerability to psychosocial stress and prevent the antidepressant-like effects of fluoxetine following stress exposure. Our data also show that inhibiting the lateral habenula can reverse stress-induced behavioral avoidance in serotonin-deficient animals, which fail to respond to fluoxetine. Our results provide additional insight into the serotonin deficiency hypothesis of depression and highlight the potential of targeting the lateral habenula to treat depression and anxiety disorders in patients who fail to respond to selective serotonin reuptake inhibitors. Brain serotonin (5-HT) deficiency and exposure to psychosocial stress have both been implicated in the etiology of depression and anxiety disorders, but whether 5-HT deficiency influences susceptibility to depression- and anxiety-like phenotypes induced by psychosocial stress has not been formally established. Most clinically effective antidepressants increase the extracellular levels of 5-HT, and thus it has been hypothesized that antidepressant responses result from the reversal of endogenous 5-HT deficiency, but this hypothesis remains highly controversial. Here we evaluated the impact of brain 5-HT deficiency on stress susceptibility and antidepressant-like responses using tryptophan hydroxylase 2 knockin (Tph2KI) mice, which display 60–80% reductions in brain 5-HT. Our results demonstrate that 5-HT deficiency leads to increased susceptibility to social defeat stress (SDS), a model of psychosocial stress, and prevents the fluoxetine (FLX)-induced reversal of SDS-induced social avoidance, suggesting that 5-HT deficiency may impair antidepressant responses. In light of recent clinical and preclinical studies highlighting the potential of inhibiting the lateral habenula (LHb) to achieve antidepressant and antidepressant-like responses, we also examined whether LHb inhibition could achieve antidepressant-like responses in FLX-insensitive Tph2KI mice subjected to SDS. Our data reveal that using designer receptors exclusively activated by designer drugs (DREADDs) to inhibit LHb activity leads to reduced SDS-induced social avoidance behavior in both WT and Tph2KI mice. This observation provides additional preclinical evidence that inhibiting the LHb might represent a promising alternative therapeutic approach under conditions in which selective 5-HT reuptake inhibitors are ineffective. After nearly two hours of viewing, I’ve learned that: (a) it appears no certification is necessary to teach on YouTube; (b) although baseball is the national pastime, no one knows how to break in a glove; and (c) if you accidentally lock a new mitt in an old car, you might be able to use a tennis ball to break in. This sets me to mulling on what motivates the making of such videos, and indeed, what motives me to pass on or describe articles about mind, brain, and behavior that I have very little real critical insight into. Just as with a kid showing off a new toy, the 'gee whiz' or 'this is neat' moment that comes from encountering a new idea or bit of work is enhanced by sharing it with others. The previous post noting recent work by Dacher Keltner and collaborators prompted me to have another look at the website of "The Greater Good Science Center" at the University of California Berkeley that Keltner and others have established. It has recently developed another website, Greater Good in Action, that offers engaging brief exercises in practices shown by research to enhance and build all sorts of good stuff: connection, empathy, kindness, compassion, forgiveness, gratitude, happiness, optimism, resilience to stress, awe, etc. Just clicking through, and spending maybe 5-10 minutes, on a few of the exercises leaves me with a mushy warm glow of contentment, which persists for varying periods of time until my usual default curmudgeonly self reappears. You might enjoy trying some. Awe, like reverence, is a pro-social emotion that subordinates individual self interest to a larger whole. Dacher Keltner and Paul Piff, in their NYTimes piece publicizing of their more academic publication (marketing is a necessity these days) describe five different studies, each providing experimental evidence that awe helps bind us to others, motivating us to be more generous and helpful to strangers, to act in collaborative ways that enable strong groups and cohesive communities. The positive effect of awe on prosociality are partly explained by feelings of a smaller self. ...even brief experiences of awe, such as being amid beautiful tall trees, lead people to feel less narcissistic and entitled and more attuned to the common humanity people share with one another. In the great balancing act of our social lives, between the gratification of self-interest and a concern for others, fleeting experiences of awe redefine the self in terms of the collective, and orient our actions toward the needs of those around us. You could make the case that our culture today is awe-deprived. Adults spend more and more time working and commuting and less time outdoors and with other people...Attendance at arts events — live music, theater, museums and galleries — has dropped over the years...Arts and music programs in schools are being dismantled in lieu of programs better suited to standardized testing; time outdoors and for novel, unbounded exploration are sacrificed for résumé-building activities. We believe that awe deprivation has had a hand in a broad societal shift that has been widely observed over the past 50 years: People have become more individualistic, more self-focused, more materialistic and less connected to others. To reverse this trend, we suggest that people insist on experiencing more everyday awe, to actively seek out what gives them goose bumps, be it in looking at trees, night skies, patterns of wind on water or the quotidian nobility of others — the teenage punk who gives up his seat on public transportation, the young child who explores the world in a state of wonder, the person who presses on against all odds. Natural daily rhythms in spontaneous movement patterns in both humans and mice show scale invariance, i.e., movement patterns repeat over time scales of minutes to hours. These scale invariant patterns decay with aging in both humans and mice, apparently correlating with progressive dysfunction of circadian pacemaker circuits in the brain's suprachiasmatic nucleus. Scheer and collaborators have now shown that in both aged and young mice exercise is a crucial variable. Loss of scale invariance associated with both inactivity and aging can be restored by exercise, even in old animals. In healthy humans and other animals, behavioral activity exhibits scale invariance over multiple timescales from minutes to 24 h, whereas in aging or diseased conditions, scale invariance is usually reduced significantly. Accordingly, scale invariance can be a potential marker for health. Given compelling indications that exercise is beneficial for mental and physical health, we tested to what extent a lack of exercise affects scale invariance in young and aged animals. We studied six or more mice in each of four age groups (0.5, 1, 1.5, and 2 y) and observed an age-related deterioration of scale invariance in activity fluctuations. We found that limiting the amount of exercise, by removing the running wheels, leads to loss of scale-invariant properties in all age groups. Remarkably, in both young and old animals a lack of exercise reduced the scale invariance in activity fluctuations to the same level. We next showed that scale invariance can be restored by returning the running wheels. Exercise during the active period also improved scale invariance during the resting period, suggesting that activity during the active phase may also be beneficial for the resting phase. Finally, our data showed that exercise had a stronger influence on scale invariance than the effect of age. The data suggest that exercise is beneficial as revealed by scale-invariant parameters and that, even in young animals, a lack of exercise leads to strong deterioration in these parameters. IN 1890, the American psychologist William James famously likened our conscious experience to the flow of a stream...recent research has shown that the “stream” of consciousness is, in fact, an illusion. We actually perceive the world in rhythmic pulses (brain waves that correlate with states like calm alertness and deep sleep) rather than as a continuous flow....We are exploring the possibility that brain rhythms are not merely a reflection of mental activity but a cause of it, helping shape perception, movement, memory and even consciousness itself...What this means is that the brain samples the world in rhythmic pulses, perhaps even discrete time chunks, much like the individual frames of a movie. From the brain’s perspective, experience is not continuous but quantized. It turns out, for example, that our ability to detect a subtle event, like a slight change in a visual scene, oscillates over time, cycling between better and worse perceptual sensitivity several times a second. Research shows that these rhythms correlate with electrical rhythms of the brain. If that’s hard to picture, here’s an analogy: Imagine trying to see an animal through a thick, swirling fog that varies in density as it drifts. The distinctness of the animal’s form will oscillate with the density of the fog, alternating between periods of relative clarity and opaqueness. According to recent experiments, this is how our perceptual systems sample the world — but rather than fog, it’s brain waves that drive the oscillations...Rhythms in the environment, such as those in music or speech, can draw neural oscillations into their tempo, effectively synchronizing the brain’s rhythms with those of the world around us. ...presented listeners with a three-beat-per-second rhythm (a pulsing “whoosh” sound) for only a few seconds and then asked the listeners to try to detect a faint tone immediately afterward. The tone was presented at a range of delays between zero and 1.4 seconds after the rhythm ended. Not only did we find that the ability to detect the tone varied over time by up to 25 percent — that’s a lot — but it did so precisely in sync with the previously heard three-beat-per-second rhythm. All of this points to the need for a new metaphor. We should talk of the “rhythm” of thought, of perception, of consciousness. Conceptualizing our mental experience this way is not only more accurate, but it also situates our mind within the broader context of the daily, monthly and yearly rhythms that dominate our lives. ...in modern science we've gotten used to the idea that science doesn't offer meaning in the way that institutional religions did in the past. I'm increasingly thinking that this idea that modernity puts us in a world without meaning….may be completely wrong. We may be living in an intellectual building site, where a new story is being constructed. It's vastly more powerful than the previous stories because it's the first one that is global. It's not anchored in a particular culture or a particular society. This is an origin story that works for humans in Beijing as well as in Buenos Aires...it sums over vastly more information than any early origin story….across so many domains, the amount of information, of good, rigorous ideas, is so rich that we can tease out that story. The Christian's Big History project reminds me of the Natural Sciences 5 course originated by my mentor George Wald, which I taught in when I was a Harvard senior and then graduate student in 1963-67. These efforts have started with cosmology, the origin of the university, the solar systems and earth, the appearance and evolution of life, and finally the human story. I had a look at Chapter 5 of the online Big History Project (aimed at middle and high school level, 13-17 year olds) and found it reasonably engaging. ...promoting science as a universal moral guide. This proposal is an old one. The 19th-century French philosopher Auguste Comte and the American intellectuals Walter Lippmann and John Dewey all wrote that moral progress depended on the scientific method. Morality depends on “the totality of facts that relate to human well-being, and our knowledge of it grows the more we learn about ourselves, in fields ranging from molecular biology to economics,” Harris has stressed the special role of his own field, cognitive science. Every discovery about the brain’s experience of pleasure and suffering has implications for how we should treat other humans. Moral philosophy is really an “undeveloped branch of science” whose laws apply in Peoria just as they do in the Punjab. Pragmatist philosophers like Philip Kitcher offer a different approach to the question of atheist morality, one based on “the sense that ethical life grows out of our origins, the circumstances under which our ancestors lived, and it’s a work in progress,” he said. In the pragmatist tradition, science is useful, but ethical claims are not objective scientific facts. They are only “true” if they seem to “work” in real life. Sleep stabilizes, but does not enhance, motor performance training. Sleep supports the consolidation of motor sequence memories, yet it remains unclear whether sleep stabilizes or actually enhances motor sequence performance. Here we assessed the time course of motor memory consolidation in humans, taking early boosts in performance into account and varying the time between training and sleep. Two groups of subjects, each participating in a short wake condition and a longer sleep condition, were trained on the sequential finger-tapping task in the evening and were tested (1) after wake intervals of either 30 min or 4 h and (2) after a night of sleep that ensued either 30 min or 4 h after training. The results show an early boost in performance 30 min after training and a subsequent decay across the 4 h wake interval. When sleep followed 30 min after training, post-sleep performance was stabilized at the early boost level. Sleep at 4 h after training restored performance to the early boost level, such that, 12 h after training, performance was comparable regardless of whether sleep occurred 30 min or 4 h after training. These findings indicate that sleep does not enhance but rather stabilizes motor sequence performance without producing additional gains.